As always, DVDs that are sold have region codes, which restrict the DVDs to be played on DVD players in other regions for the sake of letting film distributors control aspects of a release, including content, release date and price. For instance, if you got a DVD sold in France and a DVD player sold in America, you'll probably fail in playing it and get an error"This disc is not formatted to play in this region." This is because your DVD has a region code of 2 while the DVD player comes with a region code of 1, which are of total difference. Generally, the DVD world is separated into the following geographical regions. * Rip RCE/regional DVDs (in PAL or NTSC) to Mac, PC, MP4, MOV, AVI, H.264, iPhone, iPad, Android etc. No quality loss and 36X faster speed. Discs that bear the region 0 symbol either have no flag set or have regions 1–6 flags set. Region 0 is commonly referred to as "Region Free", especially when talking about DVD and Blu-ray Disc players. Why do we have region codes on DVD? Shortly, money. For instance, Hollywood film distribution companies need to protect their profits to the maximum degree. Picture this, a movie is released in the U.S.A in January, and its DVD version comes to the public in the U.S market in September, 2017 while it makes its debut in Spain in October, 2017. So what will happen if an American friend sends the DVD version of this movie to his friends in Spain? No doubt the box office will flop in Spain. Hence, to avert the box office loss, they come up with the region code protection for DVD discs. Of course, it does work. Yet, it also brings incovenience for those who just wanna watch DVD movies themselves in different regions, no illegal distribution purpose. In case, you just need to clear region code for your convenience, below solutions are helpful. It has been highlighted that DVD region-coding has been a major inconvenience for travelers who wish to legally purchase DVDs abroad and return with them to their countries of origin, students of foreign languages, immigrants who want to watch films from their homeland and foreign film enthusiasts according to The Washington Post. Although people can get the DVD played on the DVD player successfully as long as they set the geographic area correspondingly to the disc, the limited number of times (at most 5 times) for changing the DVD player regions can be irritating. What's worse, some so-called multi-national DVD players like Sony DVD Player (cost at $34.99) only plays region one DVD. They're expensive while delivers poor performance. Now with a professional DVD ripper software MacX DVD Ripper Pro, you will no longer reset DVD player region or worry about the remaining region changing times, because the region free dvd ripper can disable code from DVD to make the DVD region free, change region codes 1 to 6, and rip regional DVD to MP4, MOV, FLV, MKV, HEVC, H264, AVI for playback on iPhone, iPad, Android, etc with 100% quality retained. Besides the ability to take region code off DVD, this program is also versed in decrypting DVDs with other copy protections, no matter CSS encryption, RCE, Disney New DVD Copy Protection or Sony ARccOS DVD protection. Below are steps to break region code and convert region 2 DVD to region 1 with this DVD region converter. Step 1: Load DVD you want to convert by clicking "DVD Disc"
Free download and run the DVD region code removal program on Mac (macOS Mojave), click "DVD Disc" button to import the DVD files. You don't need to do anything else, cuz this application can accept whatever you feed it, region code 1 DVD, region code 2 DVD.....In short, any region code DVD disc can be automatically detected. Also, you can download the Windows version to get rid of region code for DVD ripping. After you imported DVD source, this DVD region code killer will directly remove region code from DVD without any third party help or complicated steps. Here you can select the output format as you desire, like DVD to MKV, DVD to FLV, DVD to MOV, DVD to iTunes, DVD to iMovies, DVD to Fianl Cut Pro, etc. Or you can directly choose to rip DVD to iPhone XS, iPad Pro, Galaxy edge, HTC 10, Sony Xperia Z5/4, Surface Pro 4, PSP, Xbox One, etc, so that you can play any DVD movies on your gadget wherever you are. Note: As for the newly released copyright protected DVDs, you will never experience any error, thanks to its advanced title check mechansim. It enables you to make a digital copy of latest tough DVD without any DVD ripping crash, bad sector, output copy video audio out of sync issues. Click "RUN" to start to remove DVD Region Code and rip DVD to Mac. after a fraction of seconds, you can play your new DVD movies on Mac without taking along DVD player. Besides the above method to once-and-for-all make regional coded DVD to region free, you have another solution - change DVD region code on Windows 8/7. Follow the steps below without breaking much of a sweat. To open Device Manager, click Start→Control Panel→Performance and Maintenance→System→ Device Manager. Step 2: Double-click DVD/CD-ROM drives, right-click the DVD drive for which you want to change region settings, and then click Properties. Step 3: On the DVD Region tab, make the Region Code changes you want. Until now, the job is done. The DVD Region Code can be changed in limited time, a total number of 5. And when the change time is left to the last one, you need treat it very prudently, since after that it is fixed with the last region. If you are a Mac user and wanna change DVD region code on MacBook/iMac, you can refer to the DVD region code change guide for Mac guide. And if you want to playback the DVD content on mobile devices after removing disc region code, you can apply MacX MediaTrans to transfer the ripped DVD video from computer to iPhone iPad iPod. What's more, this iPhone file manager also can aid you to copy photos from iPhone iPad iPod to Mac, export music from iPhone to Mac, download eBooks from iPhone to Mac, etc. If the DVD that you want to rip is copy protected, you may get a read error when you import to your DVD ripping program. MacX DVD Ripper Pro has advanced technology that can rip copy protected DVD to hard drive and copy protected DVD to AVI, MP4, MOV, FLV, MPEG, iPhone, iPad/Mini, iPod, Android and other mobile devices. Wanna free DVD from protection. This guide centers on how to Unlock protection from DVD and rip DVD to MP4, MOV, AVI, etc using the best DVD ripping software. 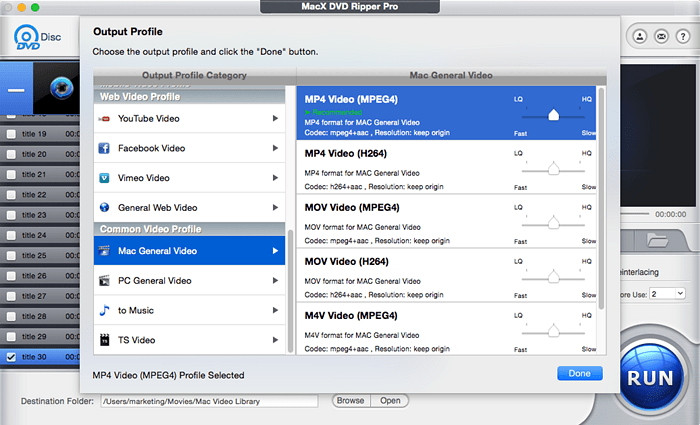 Best MacX DVD Ripper Pro allows you to freely rip regional DVDs to ISO image, MPEG2 and MKV or even portable devices. It will help you freely enjoy many newest movies at anytime and anywhere.